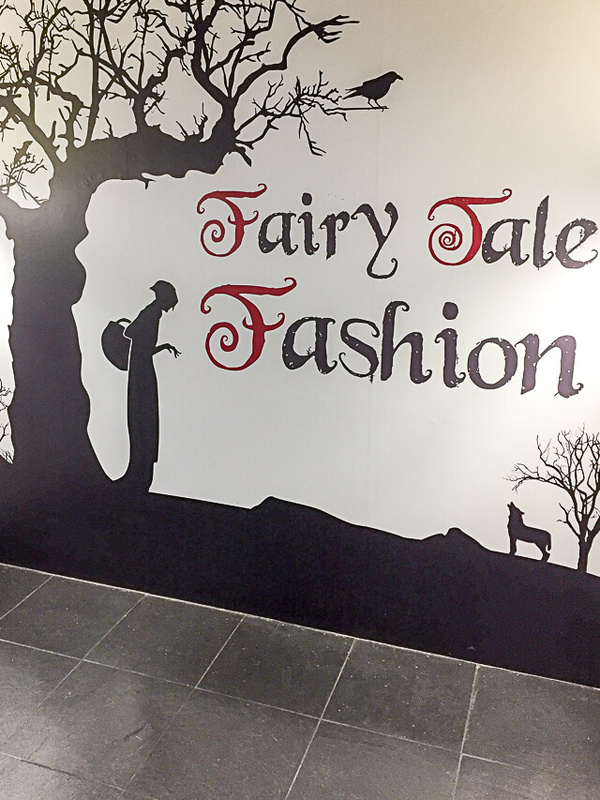 Over the weekend I visited the Fairy Tale Fashion Exhibition at the Museum at FIT with my friend Alexis, which I’ve been looking forward to seeing ever since listening to a really interesting interview with associate curator Colleen Hill. We were both blown away by the quality of the backdrops (designed by architect Kim Ackert) and the pieces on exhibit, and I was so taken by the whole theme of the show. 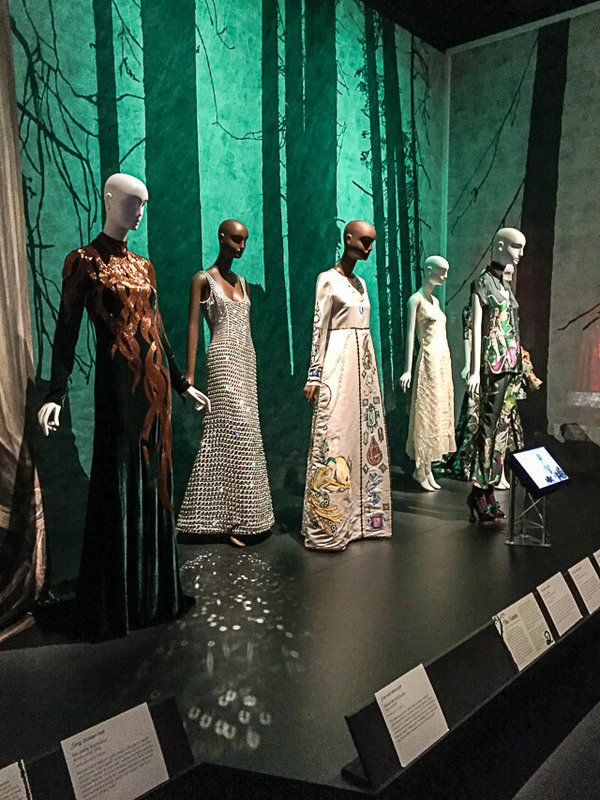 It explored the intersection between fairy tales and fashion – both the way that fashion plays such a large role in fairy tales (Little Red Riding Hood’s cloak, Cinderella’s glass slipper), and the way that designers have been influenced and inspired by fairy tales. I learned a lot of interesting facts which I’m excited to share with you here (nerd alert!). Fifteen fairy tales are featured in the exhibition, and they aren’t the Disney versions you’re used to. Some are rather obscure (such as the Brothers Grimm tale Furry Pelts – check the synopsis and I think you’ll see why they haven’t made a Disney movie about it), while others are old favorites (Cinderella, Sleeping Beauty). Featured authors include the Brothers Grimm, Hans Christian Anderson, and Charles Perrault – who in 1697 published what is considered to be the first great volume of fairy tales (based on oral folklore) – among others. 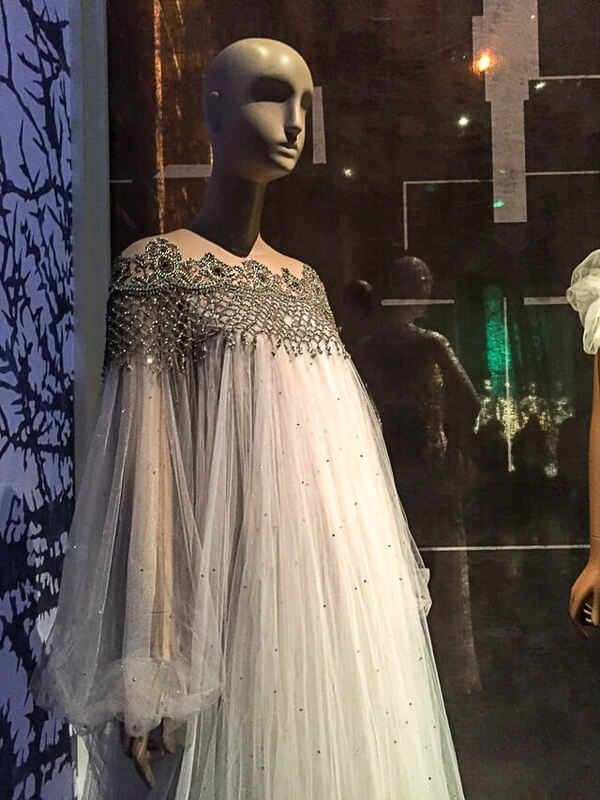 Some of the pieces on display were inspired directly by certain fairy tales or the idea of fairy tales in general, while others were chosen for the show simply because they possess elements that can be easily linked to a particular tale – such as a the ethereal white Marchesa gown above, which happens to evoke Sleeping Beauty’s nightgown. 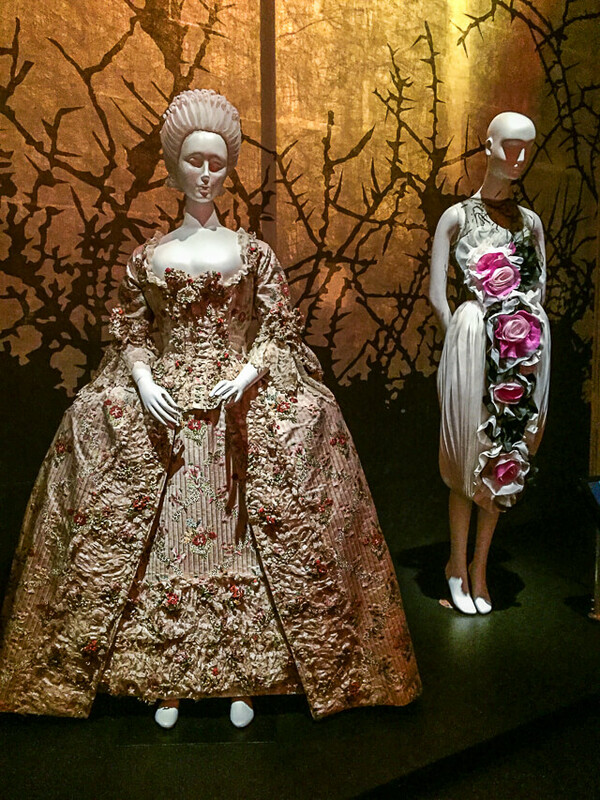 The gown above dates from 1775, while the rose dress is a more contemporary Rodarte piece – both representing Beauty and the Beast (which was recorded and popularized in the 1700’s). 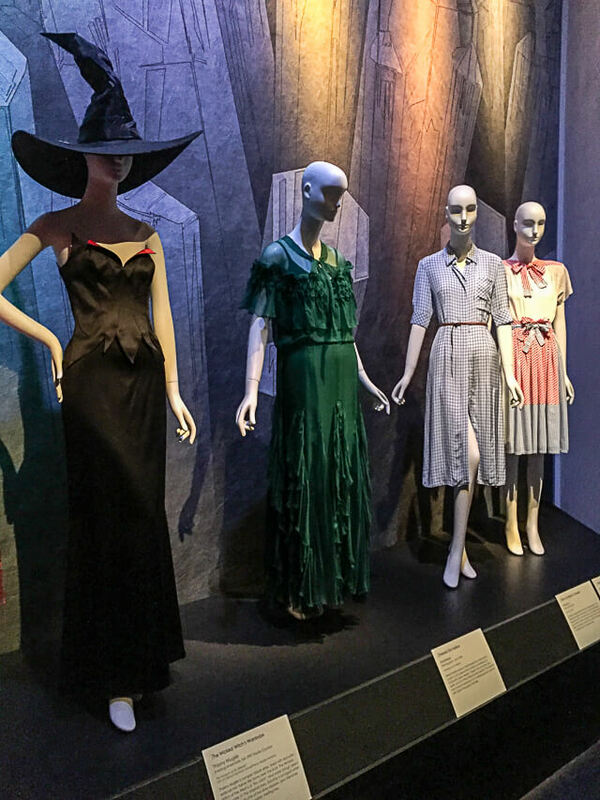 One reason I learned a lot at this exhibition is that I latched onto a guided tour that turned out to be a class full of students (um, what class is this that takes you on a field trip to a fashion museum? How can I sign up?). 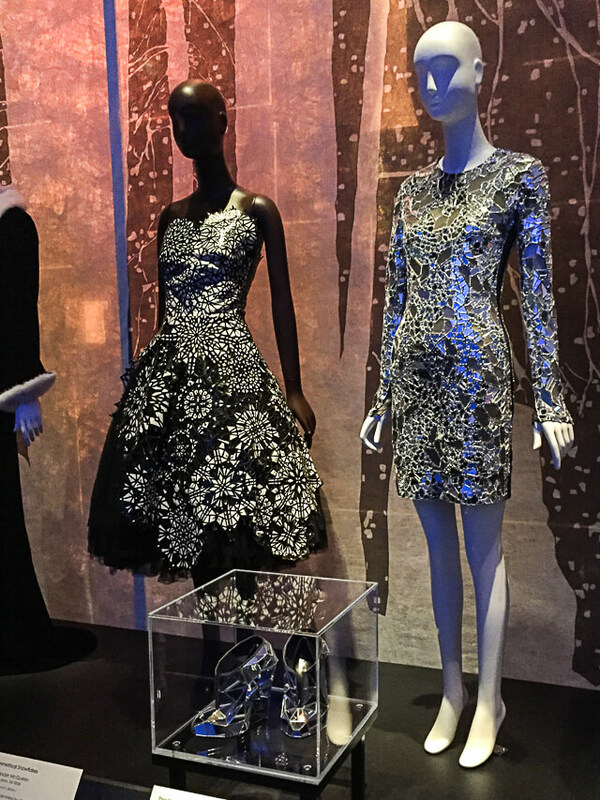 Because fairy tales are rarely set in a specific time period, the pieces in the exhibition (some borrowed and some pulled from the Museum’s permanent collection – which is composed of over 50,000 objects! ), date from the 18th century to the present. 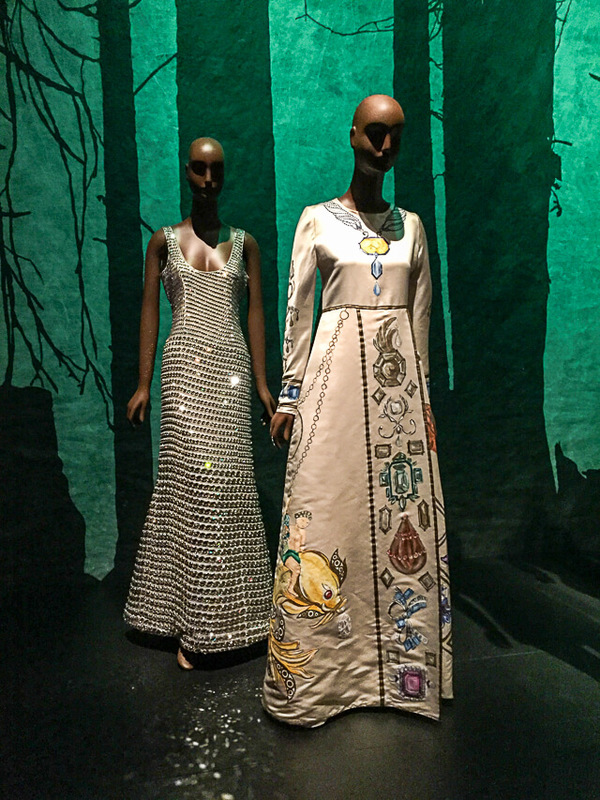 The green dress on the left is from an Alexander McQueen collection based on witches. 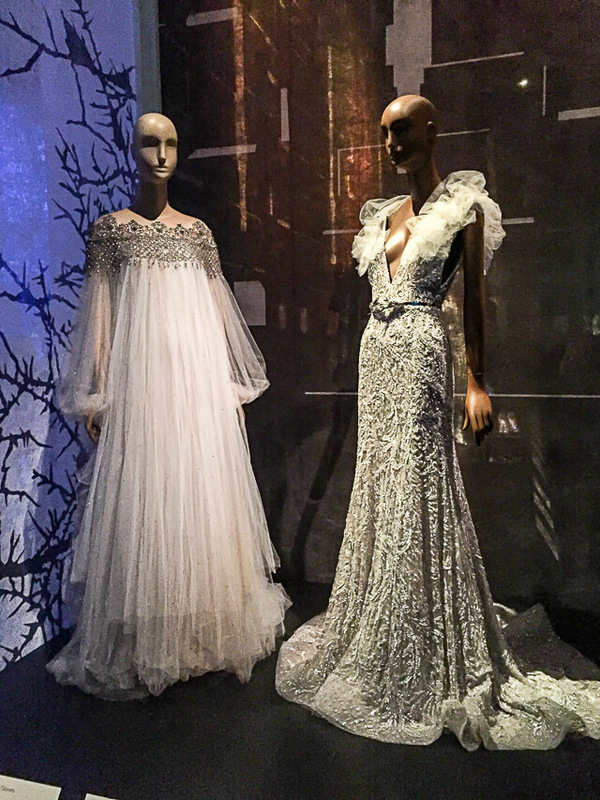 The gem-encrusted gown on the left weighs around 40 pounds. 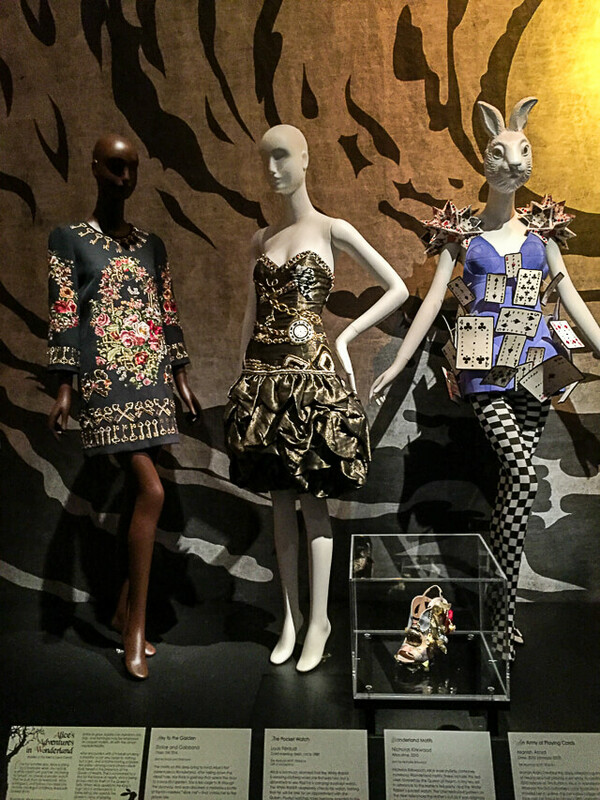 Here, a collection of dresses that showcase symbols from Alice in Wonderland – the first dress (a Dolce and Gabbana) has keys, the second clocks, and the third playing cards. The Manish Arora playing cards dress was created for a window display at a Parisian department store in celebration of the release of Tim Burton’s 2010 version of Alice in Wonderland. Probably my favorite platform in the show is this one above, representing The Little Mermaid. In the original Hans Christian Anderson tale, the mermaid turns into seafoam when she is unable to wed the Prince. 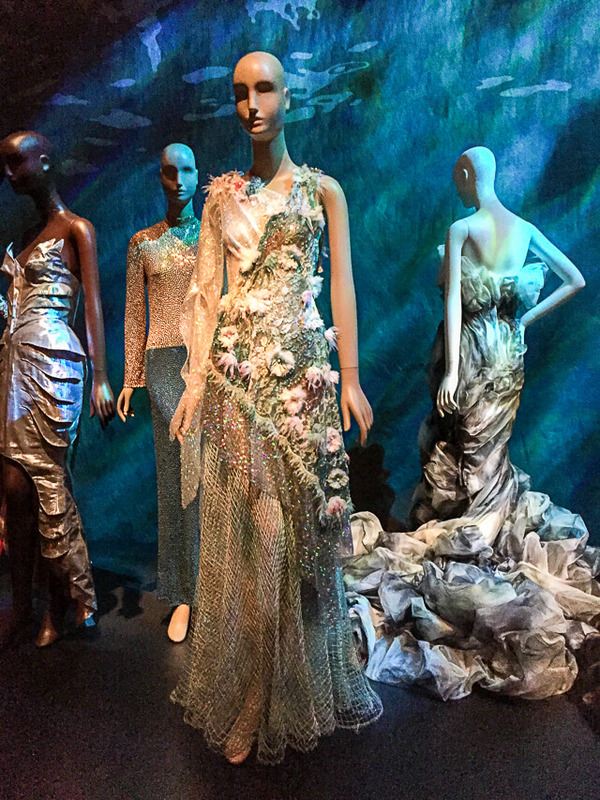 This Jean Louis Sabaji gown on the right evokes that, while the Rodarte gown in the foreground was inspired by mermaids in general. I think both are so beautiful. In Anderson’s original Little Mermaid, the mermaid’s grandmother makes much of the idea that humans are repulsed by mermaids – by their scales, their fins. This beautiful dress on the left would seem to suggest otherwise! 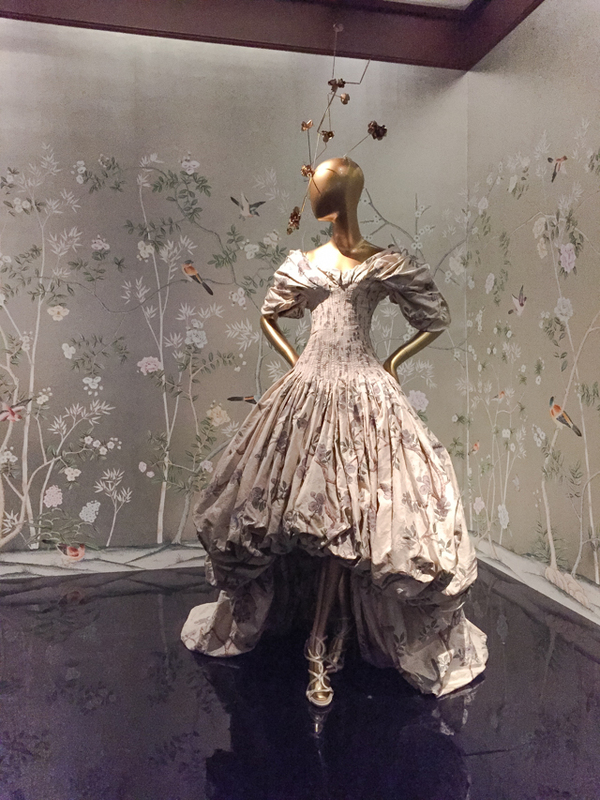 This Charles James Swan dress is featured here as representative of Joseph Jacobs’ The Swan Maidens, along with several other garments that incorporate the idea of feathers without utilizing actual feathers. 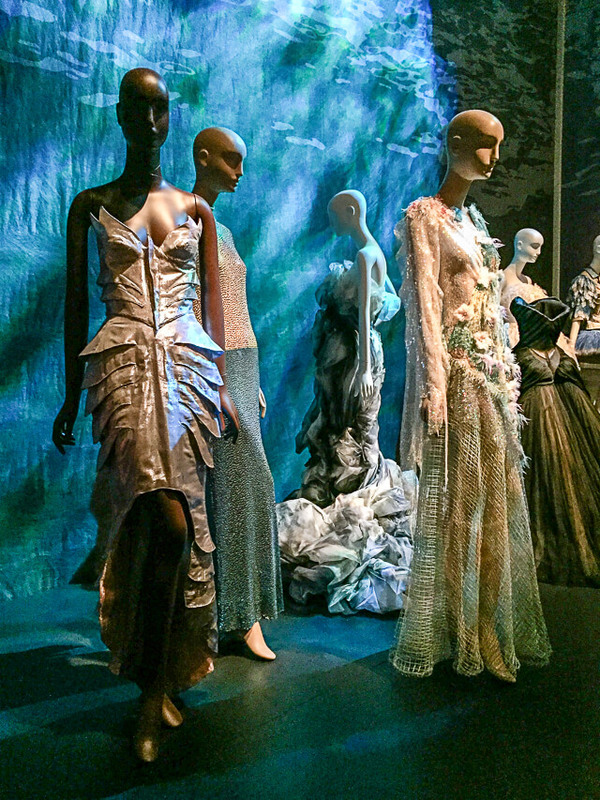 The Thierry Mugler dress on the left looks costume-y, but in fact it was part of their 1997 Haute Couture collection. It fits in well on this platform, representing the Wicked Witch from The Wizard of Oz. 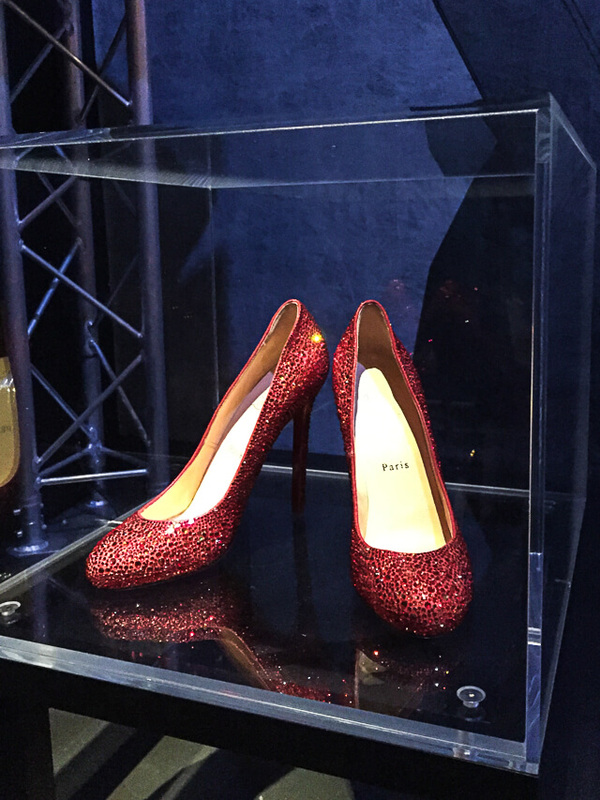 Dorothy’s ruby red slippers, as imagined by Christian Louboutin. Dorothy’s shoes are actually silver in the original story! This Tom Ford piece on the right is absolutely insane. It’s kind of hard to see, but the whole thing is pieces of cracked mirror, all fit together and nestled in like pieces of a puzzle. Amazing. Often in fairy tales, clothing is used to craft a character, reinforce particular traits, or represent a transformation. In Cinderella, when she is dressed like royalty, she is believed to be royal. When dressed as a peasant, she is believed to be a peasant. These assumptions are based on nothing but her dress, reinforcing the fantasy aspect of the tale. 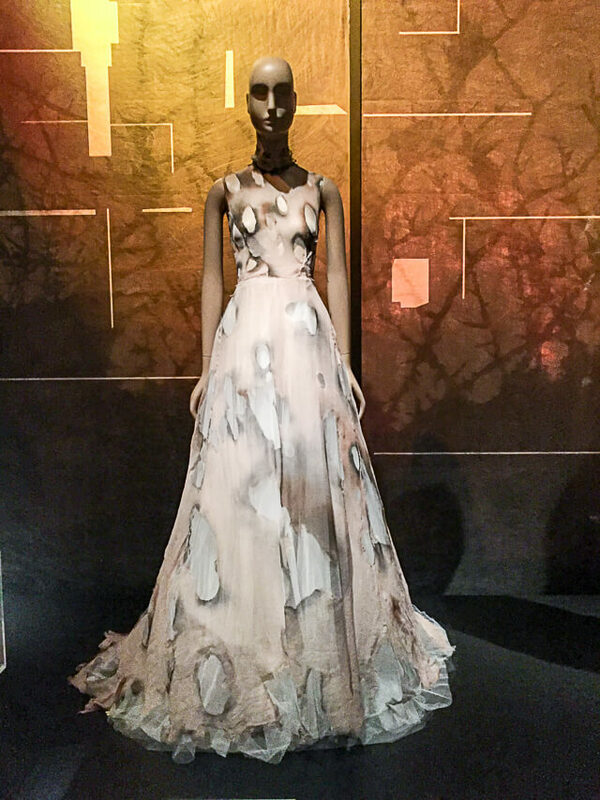 The Cinderella platform showed royal dress on one side, and peasant garments on the other – the Giles Deacon dress above was designed with a distressed fabric that appears scorched. 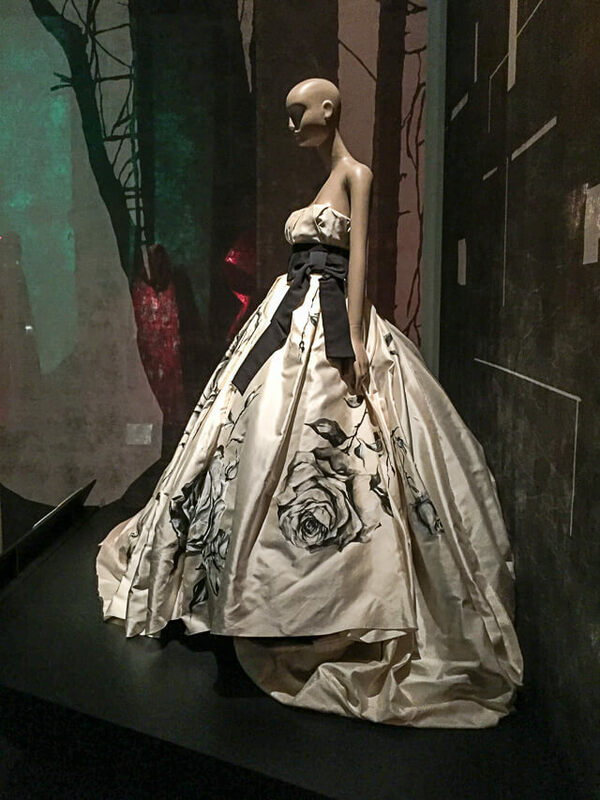 This luxurious Dolce and Gabbana gown is a nod to Snow White and Rose Red – Rose Red being Snow White’s lesser known sister. Interesting fact I learned about the Snow White tale – in the original version, before poisoning Snow White with the apple, the wicked stepmother first attempts to get to her with extra-tight corset laces and a poisoned comb – an appeal to the young girls’ vanity. 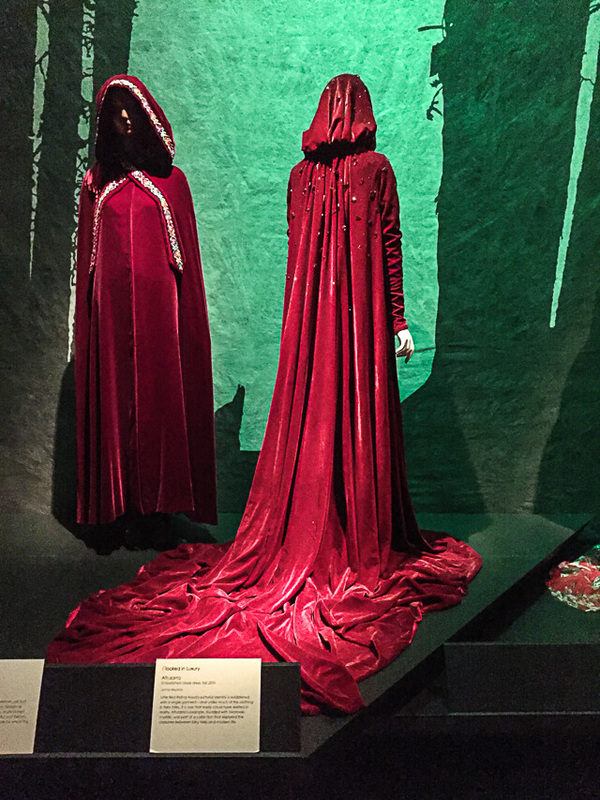 A bedazzled red cloak by Altuzarra has obvious connections to Little Red Riding Hood. 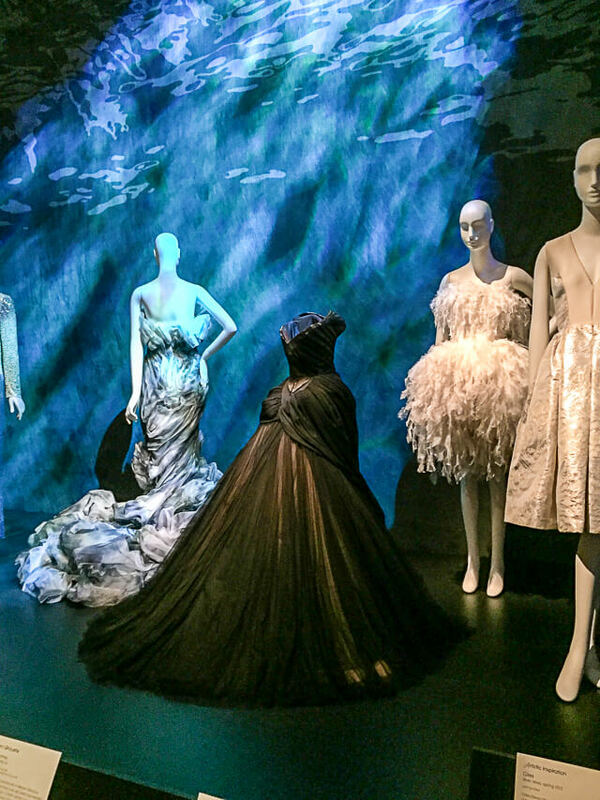 To me, this show was very similar to a Met Costume Exhibition (in size and scope it was comparable to their smaller annual fall exhibition), but of course it won’t get nearly as much hype and attention. I think it was really well-done and I just loved seeing the connections that they drew between fairy tales and fashion – a natural pairing, but one that I never much thought about. Curator Colleen Hill did a truly amazing job and I hope some of you will visit before it ends in April. 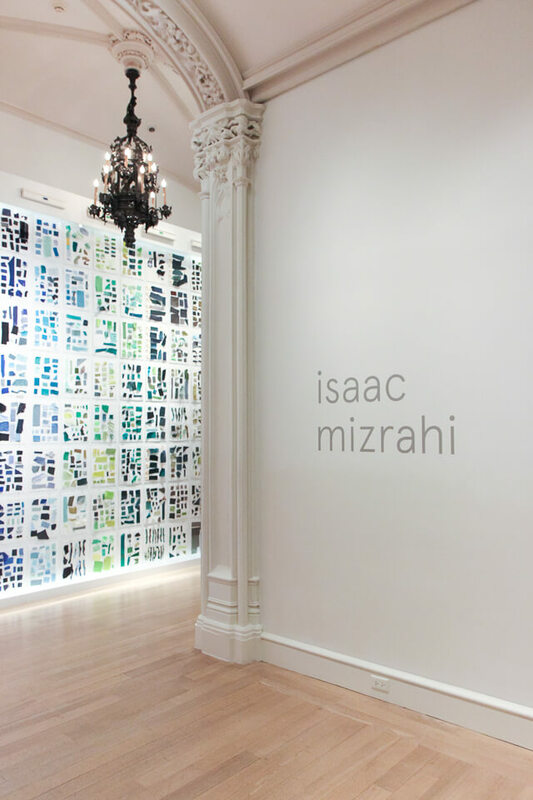 Wow, this looks like such an amazing exhibit! Such beautiful dresses, I particularly love that broken mirrored dress, it is so unique! I really want to go check out the exhibit now! 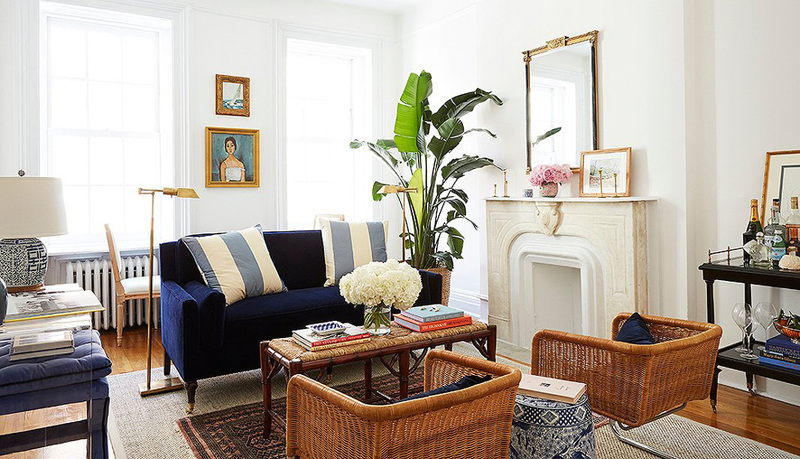 Beautiful photos Jackie. 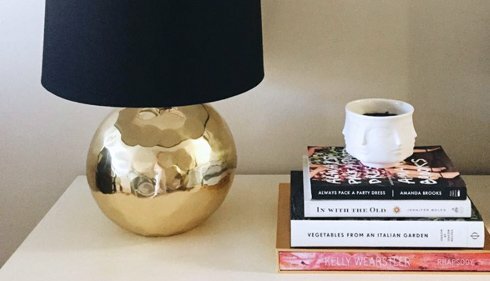 I’m sad I didn’t make it to NYC in time to catch this one but your post has helped get rid of my FoMo!